Swing options give contract holders the right to modify amounts of future delivery of certain commodities, such as electricity or gas. We assume that these options can be exercised at any time before the end of the contract, and more than once. However, a recovery time between any two consecutive exercise dates is incorporated as a constraint to avoid continuous exercise. We introduce an efficient way of pricing these swing options, based on the Fourier cosine expansion method, which is especially suitable when the underlying is modeled by a Lévy process. Zhang, B, & Oosterlee, C.W. (2013). 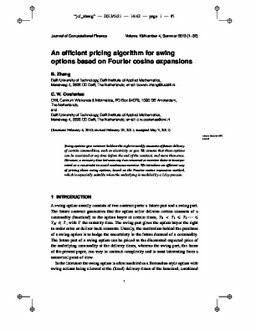 An efficient pricing algorithm for swing options based on Fourier cosine expansions. Journal of Computational Finance, 16(4), 1–32.